Despite the wicked wind and biting cold drizzles, Prague is still flooded with tourists from all corners of the world. They pack like sardines in front of the Prague Astronomical Clock at the Old Town Square to watch it strike at the exact hour and to once more relive the story of the Resurrection. Why so many people and why Prague? 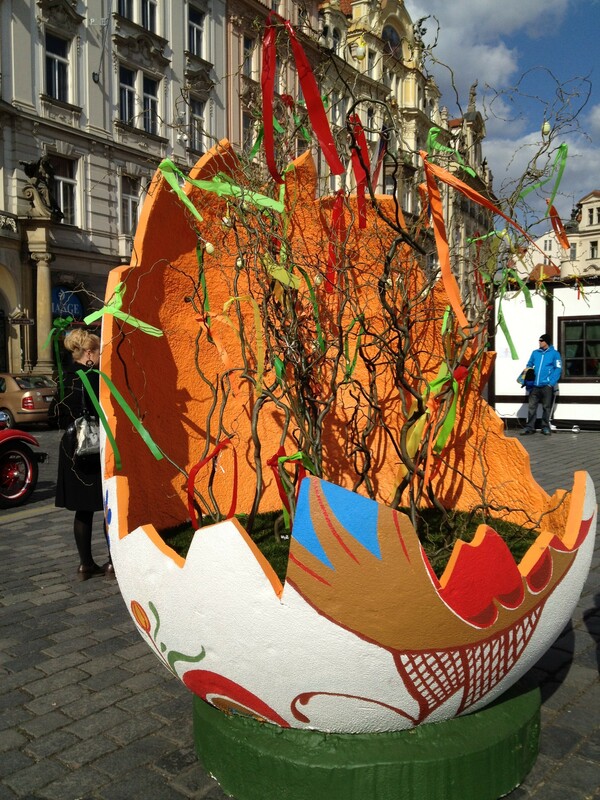 It’s almost Easter and it’s a great time for this city, the seventh most visited in the world according to the locals, to display its Easter tradition – its eggs (kraslice), whips (pomlázka), and all – although the city itself has been known as one of the least religious in Europe. As a designer, I can’t help but pay attention to how people express themselves visually, from simple store displays to complex environmental décors. I find pleasure in all these details, big or small. 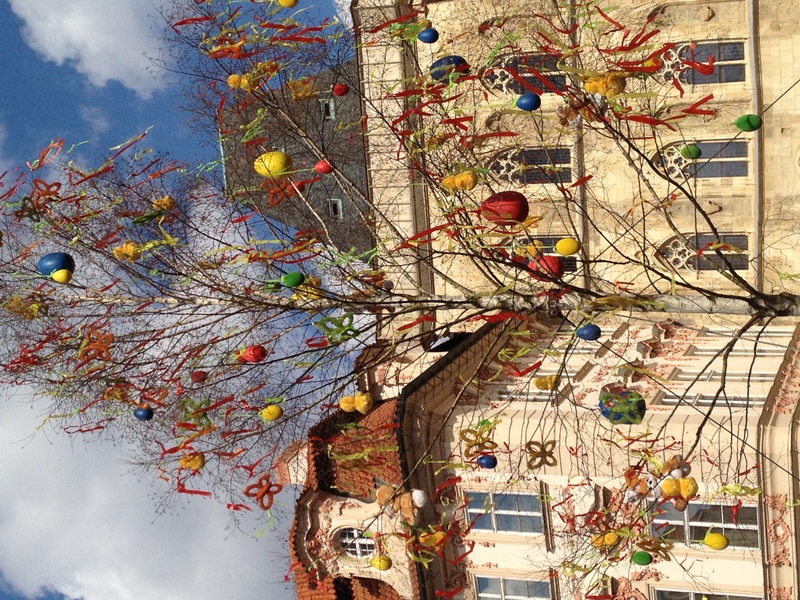 For Easter, Prague really goes all out. 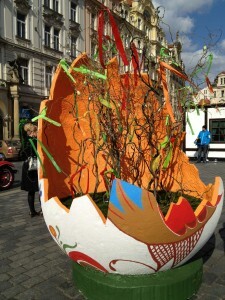 The eggs theme is used widely, in so many different designs and shapes. Many are cracked, most are exquisitely hand painted. 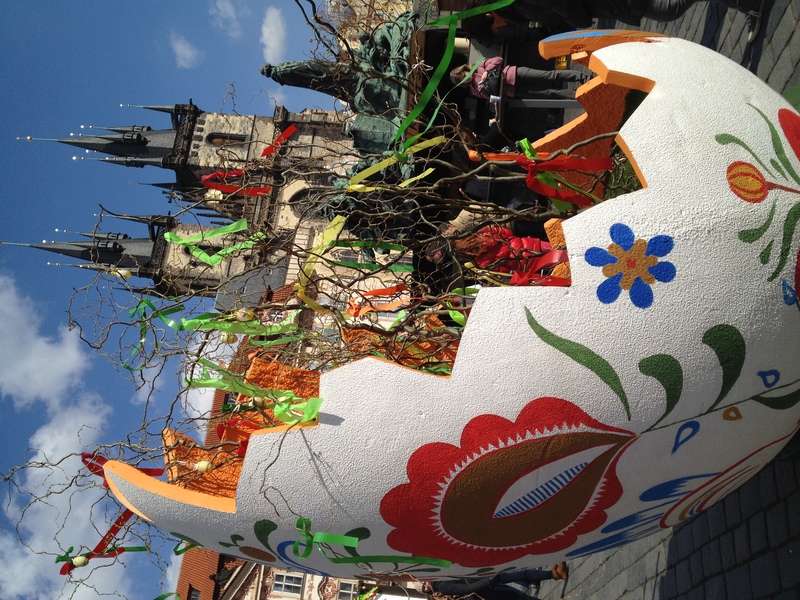 They saturate the Old Town with vibrant colors, lime, orange and yellow. What I like the most is the way the eggs are suspended in the middle of bamboo-like structures. This is an unusual way to display eggs – they appear light and fragile, but somehow ready to transform themselves, generating viewers’ expectations. A great source of inspiration for our future Easter wedding designs! Prague does not favor simplicity. All designs seem to be intentionally chaotic and unorganized. Strings and vines are generously used. Yet, among this anarchic mixture of things, there is a sense of joy, rebirth, and peace radiating everywhere. People eat, laugh and talk by fire pits where hams are being smoked by dozens. 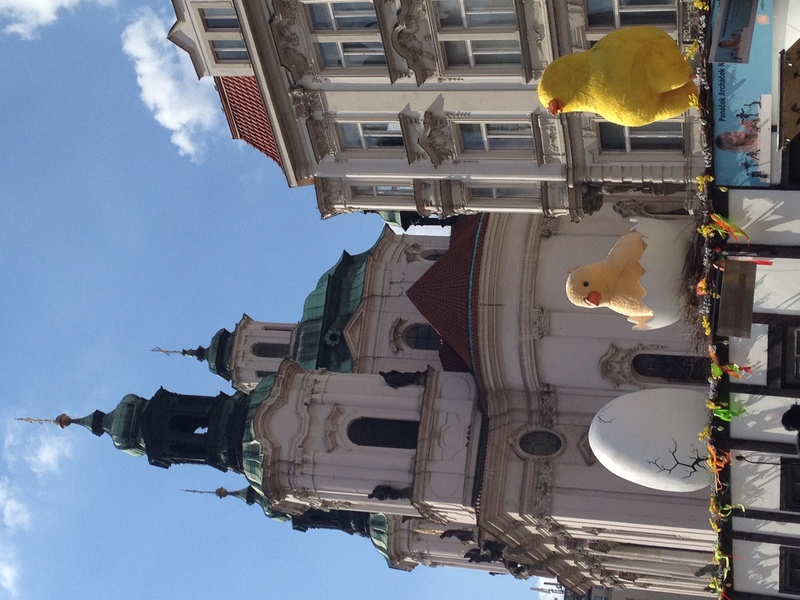 The icy wind continues to push them closer together in the Old Town Square and carries their singing higher in the air. Hot wine is served at every corner. 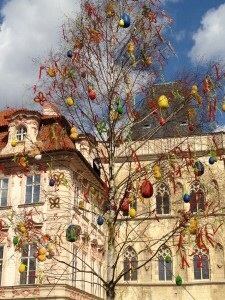 The trees are blooming with multicolored eggs attached to swinging colorful strings. 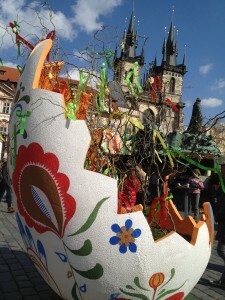 I feel elevated walking among the eggs, colors, and strangers from different shores. It would be so nice for the soul to feel this way in one of our Bay Area cities.